The Eisenhower Presidential Library and Museum is pleased to announce the commencement of a complete museum redesign. “This is an exciting time for all of us. With new scholarship and technology, the redesign will offer visitors many reasons to keep coming back. Ike and Mamie deserve the best and that is our goal,” states Director Dawn Hammatt. 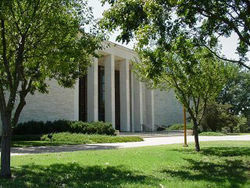 Beginning May 14, exhibits will be located in the library building while the museum gets a new look. The project is expected to take 12 months. The work will encompass the museum’s entire 25,000 square foot exhibit space. The comprehensive exhibit redesign is made possible by the Eisenhower Foundation’s successful multi-million dollar fundraising campaign.